Thanks to his legendary performance in Dracula, Bela Lugosi has earned himself a spot on the Mount Rushmore of classic horror. But he’s more than just the Count; he’s played fake vampires (Mark of the Vampire) and zombie masters (White Zombie). He’s been in proto-slashers (Night of Terror) and “true story” speculations (Phantom Ship). He’s done glorified cameos (The Black Sleep) and team-ups with the equally legendary Boris Karloff (The Black Cat). And, he’s done schlocky creature features. This is where 1940’s The Devil Bat comes in. 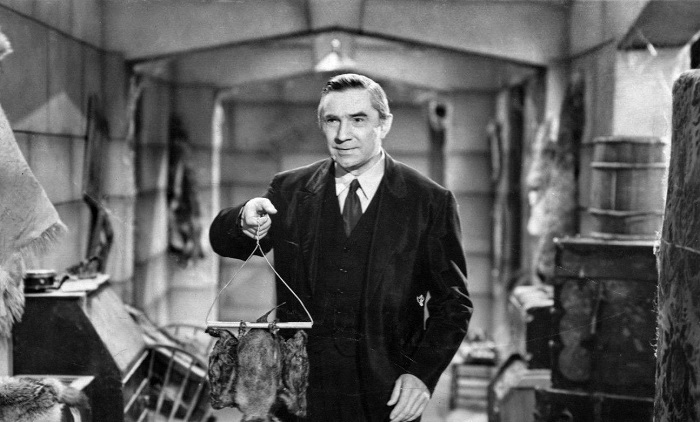 The Devil Bat stars Lugosi as a cosmetic company chemist named Dr. Paul Carruthers who has become disenchanted with his rich employers. So, he secretly breeds giant bats and trains them to attack a special aftershave lotion that he then gives to his enemies. Once word of the bat attacks gets out, a hotshot reporter named Johnny Layton (Dave O’Brien, best known from the Texas Rangers series of movies) and his photographer, “One-Shot” McGuire (Donald Kerr from The Face of Marble and Cat People), show up in town to get the scoop. They find themselves right in the middle of the action, trying to solve the crime…and get their story! Prolific short filmmaker Jean Yarbrough (The Creeper, She-Wolf of London) directed The Devil Bat from a script that screenwriter John T. Neville (A Million to One) based on a story by George Bricker (House of Horrors, The Brute Man). At it’s root, it’s a crime drama, with reporters and police trying to solve a mystery and catch a killer. Only the killer is a mutant bat that is being controlled by a mad scientist. 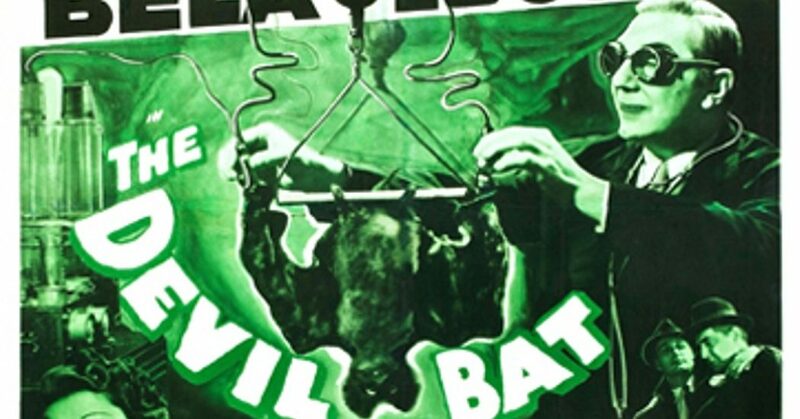 Shot quickly and efficiently for the brand-new Producer’s Releasing Corporation studio, The Devil Bat wants to be a Universal Horror movie, but winds up with both feet planted firmly in the William Castle camp. Bela Lugosi was a classically trained actor with chops to spare, but he embraced his typecasting when he made The Devil Bat. He seems to relish in the hand wringing and moustache twisting in every scene. The character of Dr. Carruthers is an interesting one. He is a pillar of the community, respected and loved by everyone, but in private, he plots and schemes against those who are closest to him. Lugosi slips between Carruthers’ two faces brilliantly, disarming his allies yet antagonizing his foes. When Layton is on to him, neither the police nor the cosmetic company fat cats believe the out-of-town reporter. Carruthers is one of them, he would never hurt anyone. Behind closed doors (or actually, behind his hidden door bookcase – don’t all conniving evildoers have one of those? 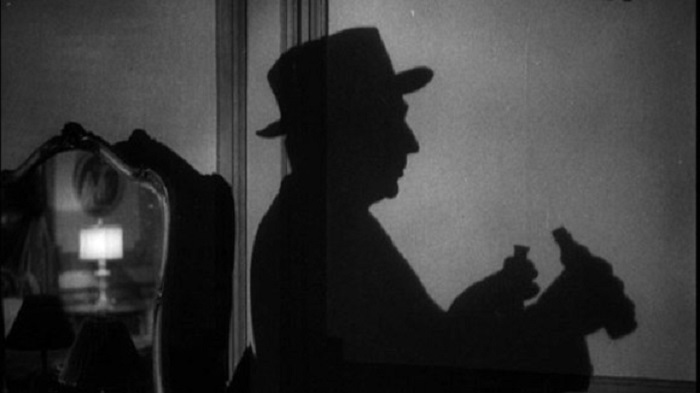 ), Carruthers is devious and mischievous, and Lugosi plays him just as cartoonishly as he can. And speaking of cartoonish, the titular Devil Bat is a hilarious example of early low-budget special effects. It’s obviously a giant stuffed bat flying around on wires, swinging into actors who grab it and pretend that they’re being attacked. And it embraces the corniness of it all. One can’t help but smile at the ingenuity of the circus sideshow parlor trick feel of it. Modern audiences that are used to slick CG monsters will cheer with glee at the absurdity of the creature. Between Bela Lugosi’s scenery chewing and the silliness of the eponymous monster, The Devil Bat wears its campiness on its sleeve. The visual effects may be corny, but the photography in The Devil Bat takes itself seriously. Or, at least, as seriously as a poverty row horror flick can. The movie was shot by cinematographer Arthur Martinelli (White Zombie, Revolt of the Zombies) in that same black and white, film noir-ish style that so many of the classic horror B-movies from the era share. The scenes in Carruthers’ lab are lit almost sarcastically, which is the best approach when the subject being lit is a giant mutant bat. 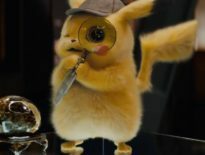 The film’s comically dark mood is constructed around plenty of shadowy figures and dark corners, with the illusion of natural light coming from sources like the bright moon or a dim lamp. 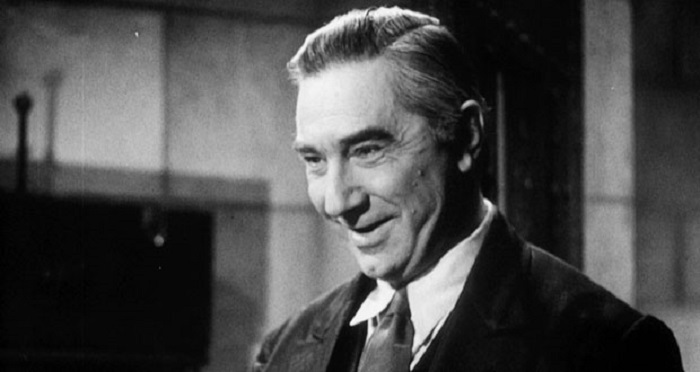 And in the middle of all of the darkness and treachery is the selectively focused face of Bela Lugosi. 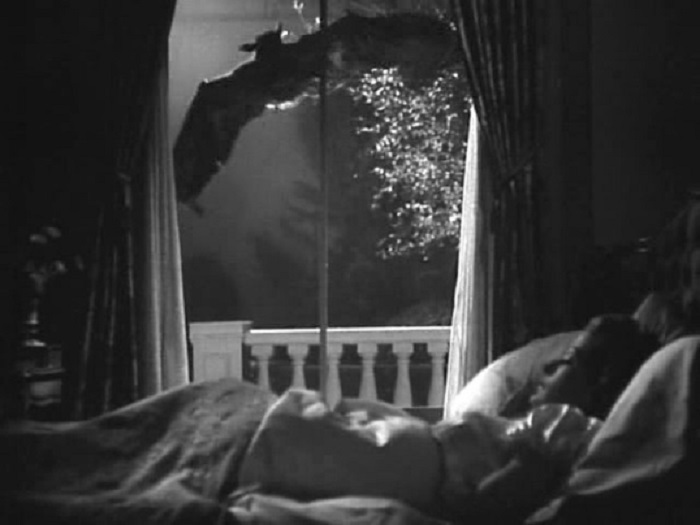 The Devil Bat turned out to be the one of most profitable productions for the upstart PRC, partially because of the studio’s tenacity – the movie was re-released on a double bill with Man Made Monster the year following its initial release (a movie which starred another Universal horror legend – Lon Chaney Jr.). It also inspired a loose remake called The Flying Serpent as well as a looser sequel called Devil Bat’s Daughter, both in 1946. But really, none of those movies managed to capture the same low-budget magic as The Devil Bat.